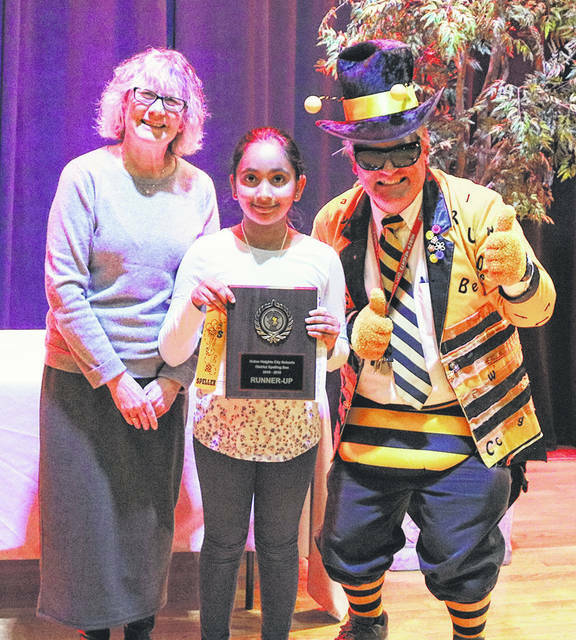 Ziya Patel placed second in the Huber Heights City Schools Spelling Bee. She is pictured with Superintendent Sue Gunnell and School Psychologist Curt Hefner. Lillian Creeger was the winner of the Huber Heights City Schools Spelling Bee. She is pictured with Superintendent Sue Gunnell and School Psychologist Curt Hefner. 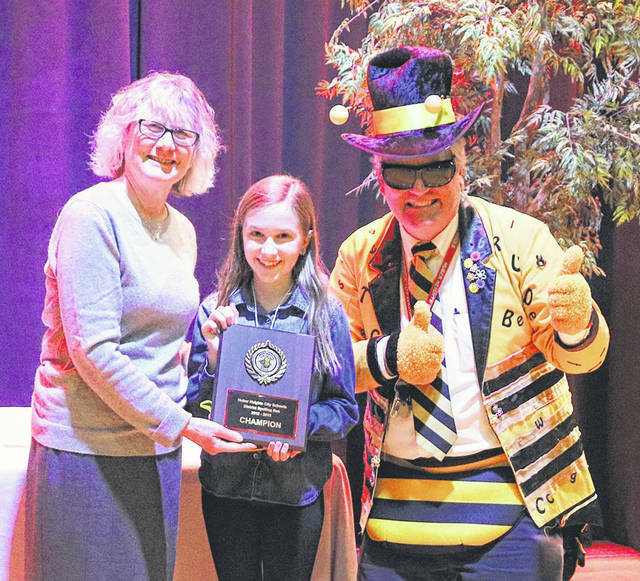 HUBER HEIGHTS — Lillian Creeger of Monticello Elementary is the 2019 Huber Heights City Schools (HHCS) District Spelling Bee champion. The sixth grader won by correctly spelling the word ‘mille-feuille.’ Ziya Patel of Valley Forge Elementary is the runner up. The winner and runner up in school spelling bees at all five HHCS elementary schools, Weisenborn Junior High, and St. Peter School in November and December advanced to the district Spelling Bee. Judges included Gina Helmick, HHCS Treasurer; Beth Morrisey, HHCS Director of Special Services; and Derrick Williams, HHCS Director of Human Resources. Donald Pugh was the announcer and Curt Hefner, a School Psychologist, kept track of each round. Donya Qendah, an 8th grade student at Weisenborn, served as host for the District Spelling Bee. Spelling Bee organizer Shalen Back, a teacher on special assignment in the district’s Curriculum & Instruction department, thought the students did an outstanding job. “I was impressed with the students’ ability to spell some highly challenging words and touched when one of the contestants offered flowers given to her as a gift to the winner of the spelling bee,” said Back. HHCS Superintendent Susan Gunnell awarded participation certificates and plaques after the competition. Up next, Creeger and the other building winners will take the Dayton-Area Spelling Bee Collaborative online test administered by Scripps. The top finishers will advance to the Dayton-Area Spelling Bee Collaborative regional contest, with the winner of that competition receiving an expenses-paid trip to the 2019 Scripps National Spelling Bee.